I have hallux limitus/rigidus but would really like to keep running/walking. Is there a shoe or insert you would recommend to allow me to continue. I am able to practice yoga but with some pain. I have constant pain even at rest but don't want to do anything invasive at this point. I can tell I'm getting more and more depressed without the natural stress release of running or vigorous walking. Any suggestions? First of all, with hallux limitus/rigidus the pain is primarily with bending the big toe joint. You definitely should attempt sports that limit that motion like biking, swimming, and elliptical. Secondly, you should work on the 4 areas that affect the big toe (that is covered throughout my blog): shoes that do not bend, carbon graphite inserts that restrict bend, spica taping that restricts bend, and orthotic devices that off weight. Thirdly, you can treat the arthritis daily with a steady dose of anti-inflammatory like icing, traumeel, zyflamend, voltaren gel or flector patches. And fourth of all, get some form of imaging or some way or checking it's progress:xrays, MRIs, CT scans, range of motion examinations, etc. Consider an MRI that you can get every few years if needed? Try cross training with sports that do not need so much toe bend. Experiment with New Balance 928 or Mizuno Wave Nirvana to limit motion. 3 times a day do something to produce an anti-inflammatory effect. Thank you for your wonderful website, which is a godsend! I hope you can guide me: I have been running with hallux rigidus (limitus) in both big toes for some 20 years, finishing 51 marathons. Over the years I have gotten a lot of orthotics custom-made, but none have brought relief to my left big toe. Recently, I have developed Ledderhose on the facia of both feet. Would you have any suggestions about orthotics which would accommodate my problem feet? I am really looking forward to your reply! I forgot to mention that I have hallux valgus (left big toe) as well as hallux rigidus (both big toes) and Ledderhose (both feet), and some pain in the other toes of the left foot. Which orthotics would you recommend for running shoes ? First of all, congratulations on 51 marathons, quite a feat (47 more than me!!). Also, for those that do not know, Ledderhose is disease where the plantar fascia gets very scarred and thickened. Typically, Ledderhose can be injected with cortisone without fear of rupture due to the severe scarring, but I am sure there are exceptions. 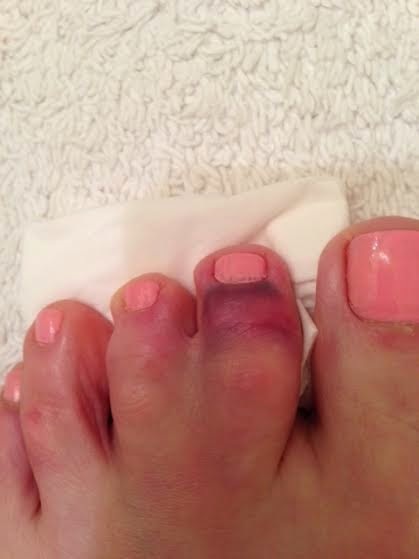 When you are designing orthotics for a situation like this there are many factors to look at. Let us look at one at a time. Hallux Limitus: Need enough of arch support and inversion to get the weight into the middle of the foot at push off. The padding in the metatarsal area should be to off weight the first metatarsal (dancer's padding). Occasionally the reverse needs to happen with padding under the first metatarsal to limit the motion (called "Morton's Extension). Also, how stiff should the forefoot be of the shoe? Should you use the New Balance 928 with a stiff rockerbottom sole? Should the orthotic be full length and stiff, like using a Sole OTC orthotic, and then making the forefoot of the device even stiffer. Should you use a carbon graphite plate under the orthotic to get your stiffness? Ledderhose: This is tricky with arch sensitivity. How much pressure can the arch take from an orthotic? Should cortisone be used to reduce the soreness before the orthotic is made? Do you need the arch support part of the orthotic or can you simply use a varus wedge to shift weight for the hallux limitus/big toe joint pain? Thanks for your reply. You hit the nail on the head: my problem is that stiff insoles hurt the Ledderhose (of the right foot), while other insoles don’t offer sufficient support and relief to the left rigid hallux. I’ve even tried a stiff (Langer) insole in my left shoe (with a cut-out under the first metatarsal, which mimics Morton’s extension) and a less stiff one in the right shoe: that worked for a couple of mid-long runs but I suspect wouldn’t be advisable, what with sending different signals to the brain, etc. I’m now using dancer’s padding with fairly pliable orthotics in my Brooks Adrenaline (a shoe which has stood me in good stead over the years—and which I desert for Nike Air Zoom Elites only for the actual marathon races), but that does not offer as much relief as stiffer insoles do. So I’ll take your advice and start experimenting, investing in a pair of New Balance 928s and in carbon graphite plates; I’m also going to try a real Morton’s extension. I won’t give up until I’ve done my 100th marathon! Thanks for your very welcome advice. May I keep you posted? Eight years ago I had two calcaneal fractures and plates and screws on the outside of both heels. About two years ago, my left foot became very supinated, and I had to quit bicycling because of the overloading on the outside of my foot. I recently had the painful left heel plate removed, and it was discovered one or both of the peroneal tendons was diseased and torn (rubbing on the plate). Dr Blake's comment: When the peroneal tendons, which pronate the foot at the heel, are injured it creates an imbalance with the tendons that supinate the foot, and the foot goes into supination/inversion. This is a pathological situation and must be corrected. The strange thing is that two weeks ago, my right foot was not supinated, until I started doing calf raises in order to rehab the left foot. Almost overnight, the right foot became very supinated. Could this extreme supination be caused by damaged or irritated peroneal tendon(s) becoming tight or shortening? Thanks. Dr Blake's comment: Definitely, the calf raises were probably the straw that broke the camel's back. The peroneal tendons are accessories to the calf muscles to lift the heel off the ground. If you get into a situation were the calf muscles are fatigued, the peroneals try to help, and if already injured, they are vulnerable to tearing. I am a long time patient of yours. I doubled my running mileage and had slight pain in my second toe as I finished. When I got home I saw the toe was black. I taped it and this morning I noticed blood on the tape. Should I make an appointment? Stop running for awhile (how long?) or pay no attention? PS. The toenail may be loose at the cuticle causing the bleeding. If so, after the first few days, when the need to use soaking and antibiotic ointment is over, gently tape the nail down 24/7 with a bandaid to see if you can get the nail to restick to the nail bed below. If not, you will lose this nail, but a new one is growing as we speak to take it's place. It is also a great time to check the length of your shoes. Standing in your shoes with socks, at the end of the day (after 6 pm) you should have a thumb width from the end of the shoe to the end of you longest toe (in your case the first). If there is any question, go up a 1/2 size or at least learn power lacing to hold you back in the heel as you run. I was hoping to get some advice from you. 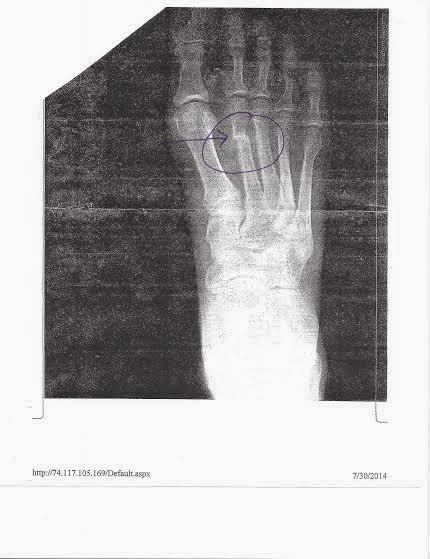 I had a stress fracture in my sesamoid bone almost 3 years ago when I was running 45 miles a week. I was in a boot for 8 weeks, took about 1.5 years off of running. I tried running on and off again with orthotics, but the orthotics actually made it worse and I could never run more than a few miles a week. I finally started running consistent mileage in March of this year. I was only running about 12 miles a week and only running every other day. I ran a 10k race and had no pain. I decided to start training for a half marathon. I only made it a few 6 miles runs and my foot pain is back. I was careful to progress slowly and only went up by 10 % each week. I'm assuming it's sesamoiditis or could it be that my fracture never really healed? (I know the blood supply is poor to the area). Dr Blake's comment: If you do not have the right orthotic in my mind, you are doomed to re-aggravate the sesamoid again and again. Once injured, it can heal, but the original injury shows that it is a vulnerable spot in your body (weak link in the chain!!). I am hopeful that this setback will get you on the road to finding the right orthotic for you. That is paramount!! I'm not sure if I should be considering removal of the sesamoid or if it's normal to have flare ups and I should just accept this and when it happens, rest, ice, strengthen calves, etc? My hip has also started to hurt so I can tell that my gait is altered. Dr Blake's comment: Removal of the sesamoid without the proper orthotic post op, which is the same orthotic you would use pre-op to hopefully avoid surgery is not a great option. It is done so so often, but there is a reason why your sesamoids are a weak spot. We do not know why it is vulnerable, but it is. You need to find out from your treating docs why it is vulnerable--plantarflexed, over pronation, hallux limitus, etc. I should mention that in the past I tried ice massage, contrast bath, orthotics, dancers pads, minimalist shoes, turf toe taping, and that it actually feels better when I'm barefoot (which is different from most people it seems). Any information you could give me would be great. Diabetes is on such a rise in the United States with all it's harmful complications. Unfortunately, for those of you who need Lipitor for high cholesterol you may not have a choice. But, it is worth a talk with your internist. I am treating many patients right now with a diagnosis of Complex Regional Pain Syndrome. It is a gross understatement to say I am treating them, since they can only be treated by a team of people since it is too complex. The most important person on that team is the patient, and they really call the shots, and hopefully I can help with direction and technical issues. If you are given that diagnosis, also known as Reflex Sympathetic Dystrophy or RSD, you are scared. The doctors and therapists who treat you are scared for you. The quicker the diagnosis is made and appropriate treatment is started, the better the response, but even those whose diagnosis is made at a snail's pace can get better. I love to see these patients every 2 weeks since there is so much to do and get organized. The visits should be a constant exploration and expansion of these Mainstays of Treatment: Identifying the source of pain, completely eliminating the pain cycle, nutrition, rehabilitation of limb function, being as productive as possible, and handling co-morbidities of anxiety and depression. I hope this summary does help those suffering make sure nothing is being forgotten, and every visit to the managing doc is as productive as possible. Version of taping to get support. 1. Lower Extremities (keep strong as long as pain free) Physical Therapist must be skilled in Neuropathic Pain treatment, not just musculo-skeletal. There are times to Honor Pain and times to Push through Pain, that can change from day to day. 6. Patient must learn how to avoid triggers (sometimes cold drafts, loud noise, etc). 7. Patient must have thorough understanding of the concept of neural tension and how to protect the sciatic nerve (or how not to irritate). 1. As the symptoms from the CRPS calms down, focus again may be necessary on the original injury which could serve as a trigger for flares. 2. Sympathetic Blocks are crucial in the first year, and their effectiveness wanes more and more as time goes on. 3. Consider Ketamine Infusion and Calmare Pain Therapy (if there are centers in your area) over the more aggressive Spinal Cord Stimulators. Both of these require initial 10 day commitments, but have great potential. 4. Neuro Prolotherapy injections are a great help to patients. I am a Bachelor of Podiatry student at the University of Newcastle in Australia. I am in my second last year of the degree and we are presently making your inverted devices. I just have a question regarding one of the indications or criteria for your devices. In two lots of our notes it states 'NCSP of 8 degrees or greater'. I don't understand why this would indicate a Blake inverted device, it doesn't seem to fit with the other criteria. I was hoping you would be able to explain this particular point to me. Thank you so very much for your question. I am happy to answer all questions to this topic so dear to me. Fire away. We will have to look closely in our conversation at what is being said to make sure you and I are on the same page. The way I read what you are saying is that one of the instances of ordering a Blake Inverted Orthotic is if the NCSP (neutral heel position) is 8 degrees inverted or greater. And this is definitely one of the criteria, for it stands for a Highly Inverted Rearfoot Varus. With this foot type, using Root criteria and technique, you must now measure the RCSP (relaxed heel position) and see if it goes to vertical, pronates to the everted side, or stays inverted. When you attempt to control this foot with the Root Technique, you are just trying to stabilize even if the foot can be held near 3-4 inverted (close to neutral position). And it is hard to do this, with typically the foot is held close to vertical. If you think about the importance of neutrality, where the foot and ankle line up, you are actually no where close with the foot pretty pronated (even when inverted slightly). Problems can develop when the patient pronates farther than the device wants them to go. Say you want them to stay around 3 inverted. The patient has a 8 degree inverted NCSP, but the device is made around a pronated 3-4 degree inverted position (the highest inversion in Root Biomechanics). Typically being this far from neutral allows too much instability in the subtalar and midtarsal joints, and the foot can not be held at 3-4 degrees inverted (unless that is the end of the range). In the same scenario, you are using the Blake Inverted Technique to not go from an everted position to vertical, but from vertical to an inverted position (same direction). A 40 Inverted Orthotic Device in a patient with a high degree of Rearfoot Varus, that really can not get to the everted side easily, typically holds the foot 8 degrees inverted (very close to neutral). My starting point is 35 degrees Inverted, and for a new practitioner probably 25 degrees, but the positioning of these orthotics are so much better than Root since they hold the foot so much closer to neutral. On July 8, 2014, I was filling my car up with gas with the automatic trigger on when the gas nozzle rocketed upwards and then nose dived onto the top of my right foot. Because the swelling was so severe, the radiologist in the urgent care center did not detect the break on the x-rays taken there. When I first visited my orthopaedic a few days later, he relied on the urgent care center x-ray and validated the contusion diagnosis. After noticing that my second toe had lifted and was curving a bit towards my third toe, I returned to my orthopaedic and asked that he take x-rays. After review, he immediately found that the metatarsal was broken. One doctor says have surgery. Another says not to. 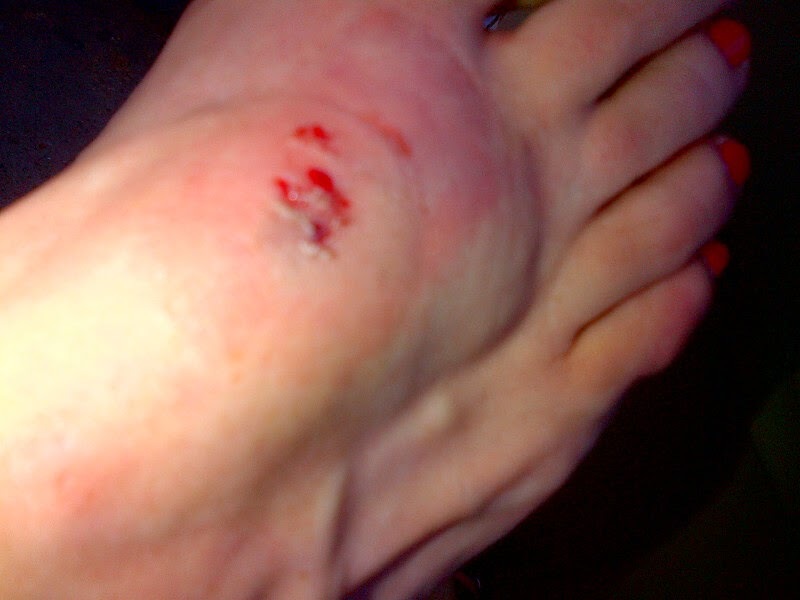 I train 5 days a week with a trainer and have run 39 marathons so full use of my foot is critical to me. I also enjoy running stairs. I've attached the x-ray that indicates the break and a picture that I took of the hit within minutes at the gas station. Thank you very much for sharing your expertise. Dr. Donald Baxter, the famous doctor regarding Baxter's nerve entrapment, examined me last week as I live in Houston, Texas. He generously spent 45 minutes with me but, at the end, was a bit conflicted so we agreed that the best plan of attack was to seek other experts' opinions. We were leaning towards surgery but figured waiting another week would not hurt. I came across your video regarding how to pull back and wrap the second toe. After watching that video and studying other videos and analyses of cases that you have posted, I felt like an old friend so I emailed you! Sadly, I did not know Dr. Roy Corbin. However, since you dedicated your blog to him, I Googled his obituary so I could better understand and appreciate your inspiration. Alas, after reading such a beautifully written obituary, I do. Please know that you continuously honor Dr. Corbin by not only dedicating your blog to him but also by helping patients near and far. Most significantly, you honor him with your thoughts of him and heartfelt actions because of him. I look forward to updating you later this week.